The B-52 Mothership flies over the X-15 after a research flight. 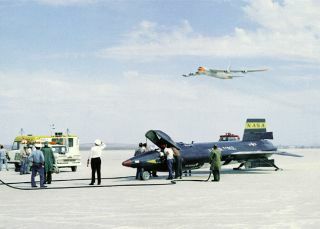 In this historical photo from the U.S. space agency, as crew members secure the X-15 rocket-powered aircraft after a research flight, the B-52 mothership used for launching this unique aircraft does a low fly-by overhead on Sept. 1, 1961. The X-15s made a total of 199 flights over a period of nearly 10 years from 1959 to 1968, and set unofficial world speed and altitude records of 4,520 mph (Mach 6.7) and 354,200 feet. Information gained from the highly successful X-15 program contributed to the development of the Mercury, Gemini, and Apollo piloted spaceflight programs, and also the Space Shuttle program.